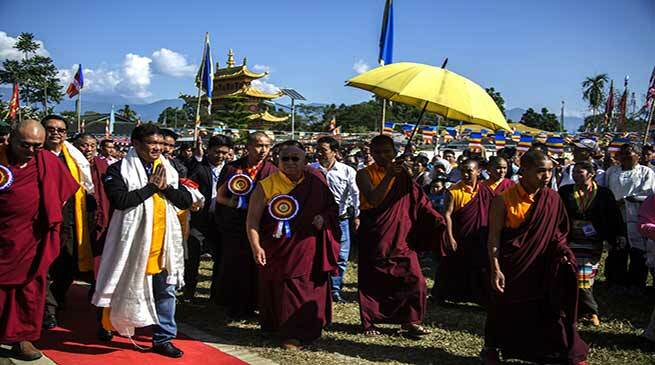 Chief Minister Pema Khandu on Sunday attended the opening ceremony of Lhagon Jangchup Choeling Monastery and enthronement of His Eminence Lhadrang Chogtrul, Pema Thinley Drodul Rinpoche at Lama camp. Deputy Chief Minister Chowna Mein, Home Minister Kumari Waii, Art & Culture Minister Dr Mohesh Chai, State BJP President Tapir Gao, Health Parliamentary Secretary Phurpa Tsering and RWD Parliamentary Secretary Jambey Tashi accompanied the Chief Minister. On arrival at the camp, the Chief Minister was given a ceremonious reception by the monks and the residents of the camp that had congregated for the opening ceremony. Khandu untied the ceremonial scarf at the entry gate formally opening the Monastery. He also inaugurated the newly constructed statue of ‘Amitabha’ and ‘Tara’. The Chief Minister was then led inside the main hall where he attended the enthronement of Rinpoche. Khandu prayed for Rinpoche’s long life and the expansion of his enlightened activities. Later in his speech at simple function organized to celebrate the event, the Chief Minister offered thanks to Dzogchen Ganor Rinpoche who through his vision, guidance and prayers had made possible the construction of the new monastery. The monastery following the Nyingmapa School of Tibetan Buddhism was established at Tezu in 1963, said Khandu. However, with growing number of monks, the need for a new Monastery building was felt needed. Calling the occasion as ‘historic’ and ‘pious’, the Chief Minister said that the occasion to celebrate the opening of a new Monastery and enthronement of Rinpoche was an opportunity that comes once in a lifetime. Mein in his speech appreciated the residents of the camp for their hard work who came here from Tibet bringing with them their vast knowledge on agriculture. Despite being from high altitude region, they have accustomed themselves with hot and humid climate of the plains well and have learnt to survive. Their hard working attitude and their skills to grow variety of crops have been imparted to locals who are now benefitting from their expertise, he said. Dr Mohesh Chai in his speech said the locals and the Tibetans have been co-existing peacefully without a single untoward incident reported from the residents of the camp. He appreciated the residents for their judicious use of state govt aided funds for construction of RCC gate, kitchen and library for the settlement. Earlier the Chief Minister inspected the ongoing construction of civilian airport here. The officials briefed that the works on runway, boundary walls, parking lot and drainage system has been completed with work in progress for passenger terminal building. They informed to complete the work by September 2018. Dr Chai briefed the Chief Minister on recurring flood damage by Sukha Nallah flowing near the airport during the monsoon. The river also had caused extensive damage to nearby agriculture farms and villages and sought additional assistance from the state government.